Looking for a small yet capable blue water cruiser? 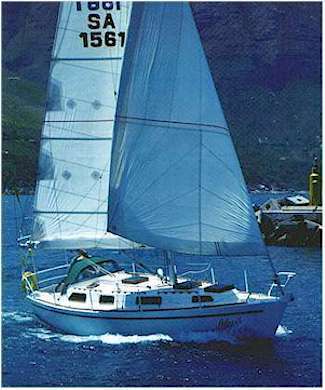 This is the bigger sister of the very seaworthy Hout Bay 30, a stout little cruiser which has proven herself over numerous ocean crossings and many miles of open water passaging. She is a strong and safe boat, with the ability to sail her way out of almost any tight spot and through most weather situations. Her modern underbody gives her well proven sailing abilities for fast and safe passages to or from whatever places you choose to visit, yet she is shallow enough to access most canal systems. These features make her a very versatile cruiser. The Hout Bay 33 now has two rudder options. She can have a full skeg with unbalanced rudder or a balanced spade rudder for light tiller steering. This design is a bigger sister to my popular HOUT BAY 30, primarily for those cruising people who want a little more space in an easily handled small steel cruising boat. She has her origins in that design and, therefore has many of its characteristics. The 30 was introduced originally with a flush deck and the alternative trunk cabin version became available later. The 33, however, was introduced from the outset with flush deck or trunk cabin options. The 33TC is the more pretty of the two and provides a safer working deck as well as a lower centre of gravity. The flush decked version has the edge in interior volume and has the feeling of a much larger boat. 3mm Steel plate is used throughout the hull and deck skins and 5mm to the keel and skeg, keeping structural weight to a minimum. The skin is supported by stringers which are in turn supported by bulkheads. The hull form is single radiused chine, closely approximating a round bilge hull but with far simpler construction. This method permits the construction of fair hulls with relative ease, well within the capabilities of a skilled amateur. Construction is over temporary frames which are replaced by tabs welded to the stringers for bolted attachment of the bulkheads. The layout is well suited to a small family or two couples, having the privacy of two sleeping cabins separate from the saloon area. 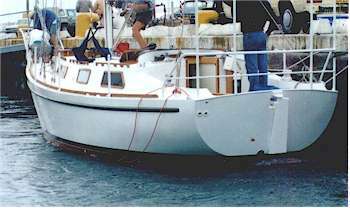 It is derived from the layout of my first steel design, the PRATIQUE 35, which has proven to be very practical through many thousands of miles of cruising the Atlantic and Pacific Oceans. The main variation is the provision of a small aftcabin enclosing the double quarter berth. The head compartment is aft, adjacent to the companion ladder, so as to be in an area of low movement. Forward heads are fine in calm weather but can be the last straw for a crew tending towards nausea in a lumpy sea. The aft position is also ideal for getting into and out of oilies without wetting the rest of the boat. A wet locker is provided alongside the head as well as a slatted seat both for showering and somewhere to sit while fighting with the oilies. The diesel engine is well forward of the stern, under the central galley worktop. It is not there because fashion has put it there on some modern designs but simply because that is the best place for it to be. It reduces weight in the ends of the boat to reduce pitching, is a pleasure to work on because it is accessible all round and gives a convenient central structure around which to plan a safe and very comfortable sea-going galley. This galley can be worked without having to tie in the cook because there are surfaces to lean against. The cook can also retreat very quickly in the event of a spill or galley fire, impossible if tied in. Modern sound insulation materials take care of the engine noise in the middle of the accommodation. The one draw-back of the engine position is the distance between the propeller and rudder. This slows the response in slow speed manoeuvring when using propwash to push the stern round but it is still effective. The rig shown is fully inboard cutter of fairly modest proportions, in keeping with the blue water image of the design. A slab reefed full batten main with lazy jacks is easy to handle and builders will have the option of roller furling or hanked headsails. The mast is double spreader to reduce weight aloft and improve efficiency. Standing intermediate backstays are shown to support the inner forestay but running backstays can be used by owners who prefer them. The 30 has shown that this hull form pulls up very little quarter wave, a major contributor to drag, while the fine entry gives good wave penetration. The 33 has slightly slimmer proportions and a flatter run aft further reducing drag. She is well suited to long distance cruising. Her displacement will give a comfortable ride while her long waterline and efficient underbody will give a sometimes surprising turn of speed. New off the drawing board is a gaff cutter version to suit the traditionalist in you. This one was commissioned by Garry Rose of Canada and is now available as part of the stock design package. For a smaller boat in this concept, see the Hout Bay 30. This design is drawn in metric and dimensioned in both metric and inches.